It’s a Friday and therefore time for a weekend competition. 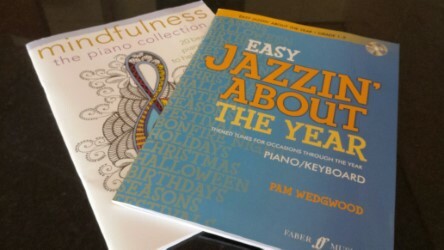 I have two books to giveaway to two lucky readers; Easy Jazzin About The Year and Mindfulness, the piano collection, both published by Faber Music. Easy Jazzin About The Year is the latest book by Pam Wedgwood, and is part of her extremely popular series, Jazzin About. It is intended for those of Grade 1-2 (elementary) level and contains a fun selection of original and favourite tunes perfect for celebrating various ‘occasions’ throughout the year, such as Halloween, Christmas and Bonfire Night. It comes with a useful CD too. Mindfulness, the piano collection is a delightful anthology of famous and less known pieces for those of around intermediate to advanced level (Grades 6-8), all designed to help you relax, unwind and practice the art of mindfulness. Works include pieces by Satie, Chopin, Ravel, Schumann, Beethoven, Einaudi, Goodall and Frahm. I have one copy of each book, so please leave your comment in the comment box at the end of this post to be in with a chance of winning. I will select the winners on Sunday evening (British time). Good Luck! If you would like to find out more or purchase these books you can do so here and here.